Russian police have seized a painting depicting President Vladimir Putin in women’s underwear from an art gallery in St Petersburg. The portrait features President Vladimir Putin combing the hair of Russian PM Dmitry Medvedev. Two other pictures were also seized which poked fun at conservative Russian politicians who led a campaign to introduce controversial anti-gay laws. Police said the paintings broke unspecified legislation. A fourth painting depicting the head of the Russian Orthodox Church adorned with tattoos was also confiscated from the Museum of the Authorities. Gallery owner Aleksander Donskoy claimed he had been given no formal warrant or explanation for the removal of the paintings, which were included in an exhibition entitled Rulers, by Arkhangelsk artist Konstantin Altunin. 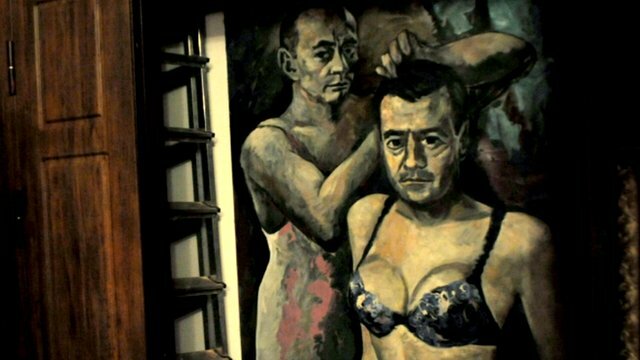 One of the pictures seized features Vladimir Putin in a nightgown, standing behind Dmitry Medvedev and stroking his hair, while the prime minister is depicted with a woman’s body and wearing lingerie. Another painting shows St Petersburg legislative assembly member Vitaly Milonov – one of the architects of Russia’s anti-gay laws – against the background of a rainbow, the symbol of gay pride. St Petersburg, which hosts the G20 summit next week, was one of the first Russian cities to introduce a law against what it terms “gay propaganda”.